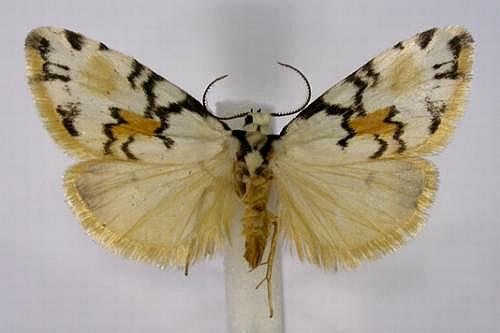 The adult moths of this species have pale yellow forewings, each with black zigzag lines and markings, and a yellow mark near the middle. 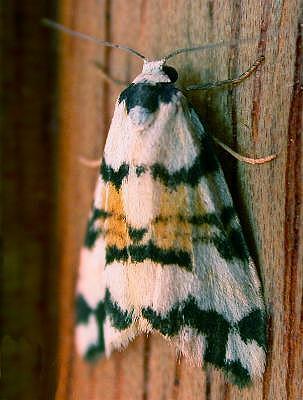 The hindwings are yellow, each with a black band around the wingtip. The head is white, and the thorax black with a white mark. The abdomen is yellow. The wingspan is about 2 cms. Band 2, Abtheilung 2 (5) (1875), p. 16, and also Plate 140, fig. 23. Entomological Society of Victoria, 2009, pp.24-25.